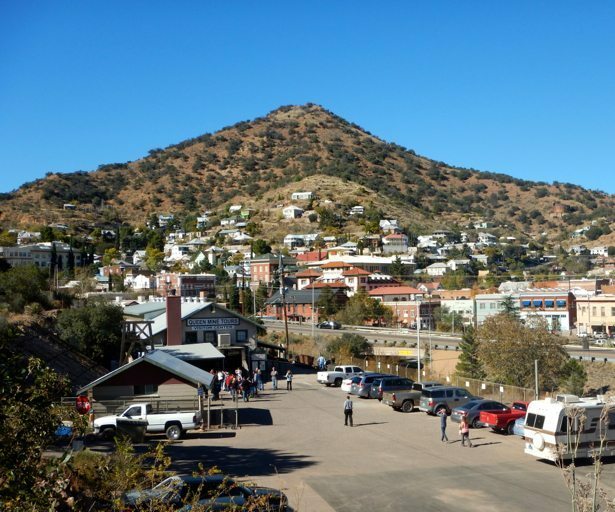 The historic mining town of Bisbee is located in the SE corner of Arizona, just south of Tombstone and barely north of the Mexican border. 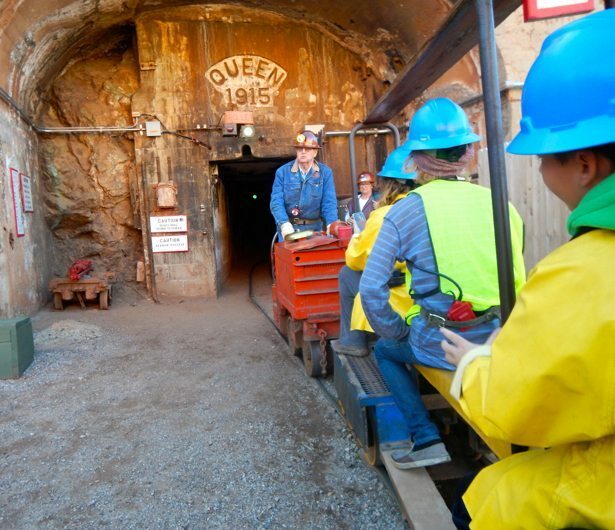 It was founded in 1880 and has a long history of underground mining for various minerals. 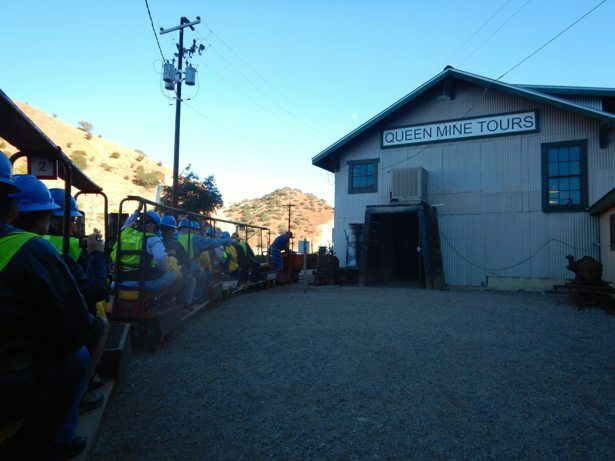 In almost 100 years of continuous production before the Bisbee mines closed in 1975, the local mines produced metals valued at $6.1 billion (at 1975 price) one of the largest production valuations of all the mining districts in the world. This staggering amount of wealth came from the estimated production of 8,032,352,000 lbs of copper, 2,871,786 ounces of gold, 77,162,986 ounces of silver, 304,627,600 lbs of lead and 371,945,900 lbs of zinc! 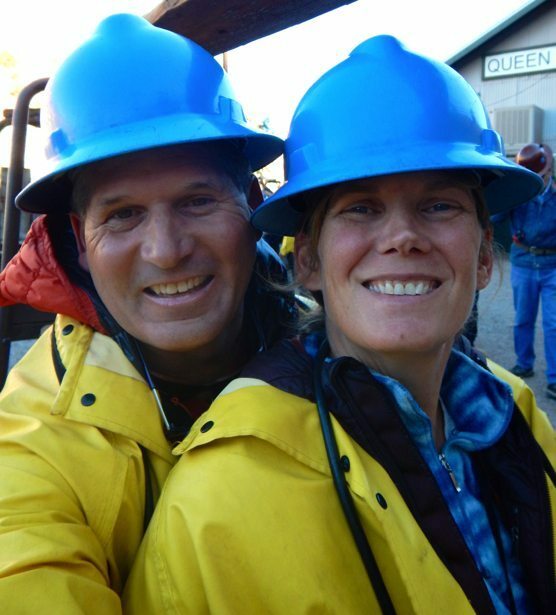 After a brief stop in Tombstone we landed in Bisbee in the early afternoon and found a quiet camp spot at the Queen Mine RV Park, which is located on the edge of town just next to the Queen Mine. 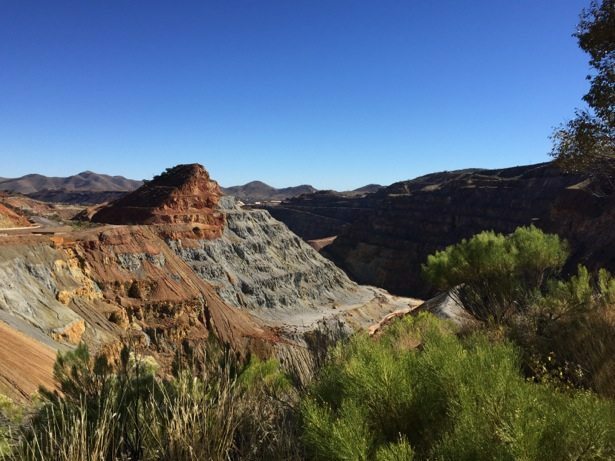 It also backs right on to the local open pit mine, which is HUGE and really enables you to see the various strands and layers of the sediment. 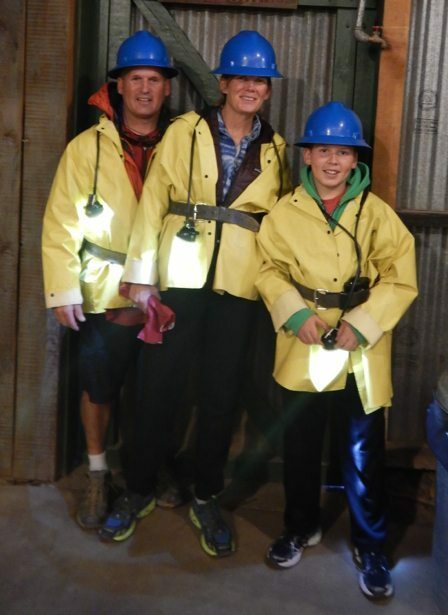 The mine tour is run by former Phelps Dodge mine employees and they do a great job of getting you geared up and organized to go under ground – complete with rain coat, helmet, belt and light. 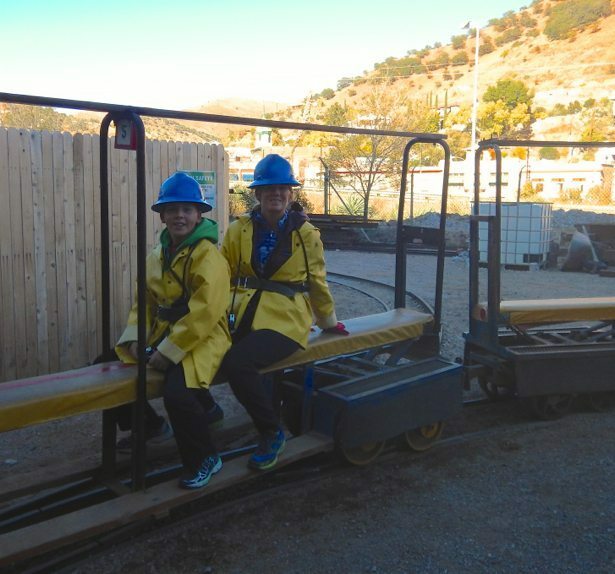 We were then loaded onto a series of trolley cars that are pulled by an actual mine cart. 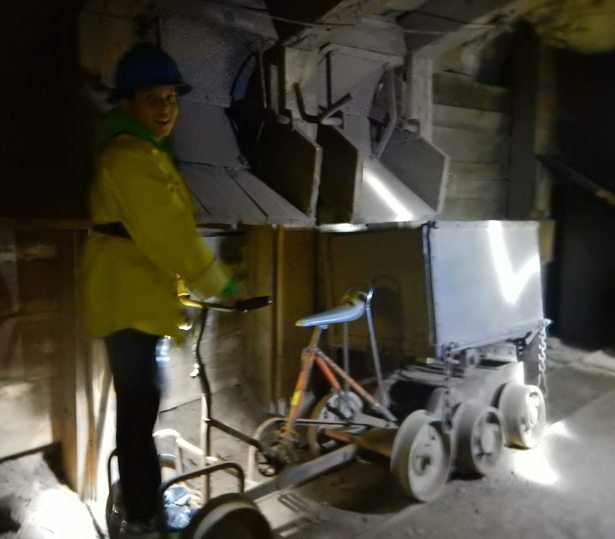 Lots of safety conversations about not reaching out to touch the walls or leaning over to pick up your helmet if it falls off (so you don’t whack your head on the mine beams as they go by). 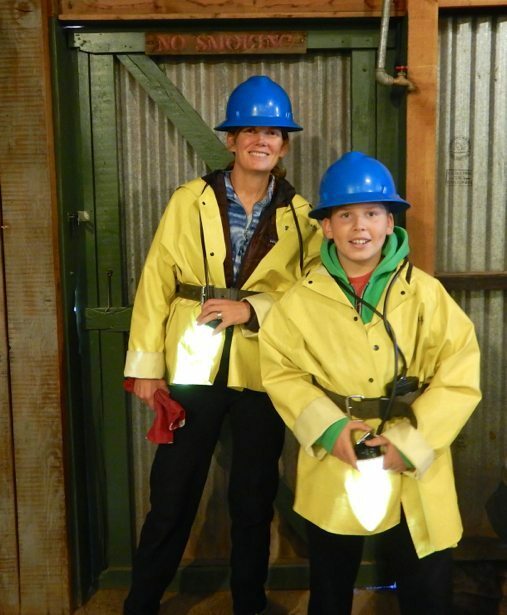 The mine tour takes you down over 1500 feet into the mine and you learn a lot about former mining techniques, life as a miner and the tools and technologies that were used over the last 100 years. The tour is only an hour in length and goes by fairly quickly however there is a small museum that you can visit before or after and it is very informative. It is also an easy walk into Old Bisbee to wander through the shops, check out the various artists and grab some food – of which there are a surprising number of choices (and variety). Well worth the stop if you are in the area! 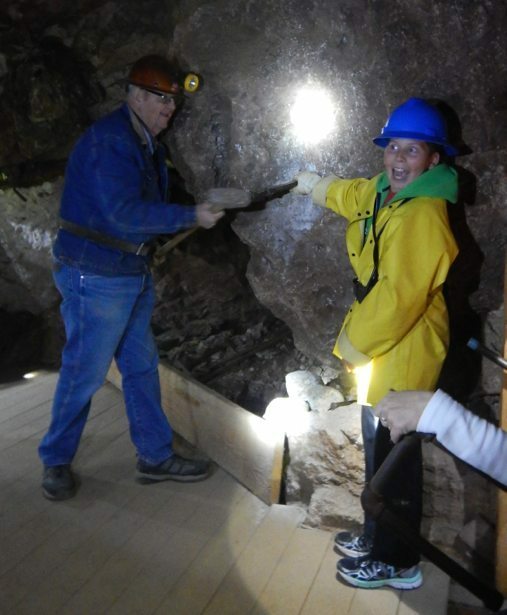 Grandpa Bob worked in the Thompson Lake International Nickel mine for 1 year.